They've been called the Swedish Explosions in the Sky, and you can only take such a comparison as flattery. 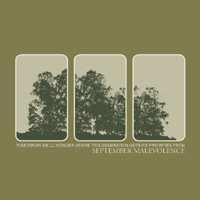 September Malevolence leads a booming Swedish instrumental scene with moody, slightly off-beat post-rock that has a perfect insight into the quiet/loud approach that has dominated the genre over the past few years. Top-notch songwriting sets Tomorrow We'll Wonder... apart from the pack, and it's a skill like that which is an indicator that this band is not a flash in the pan. Tomorrow We'll Wonder... gets darker than one would expect, but this is complemented well by a gloomy atmosphere that looms over the album. While the dark clouds are briefly cast away throughout the course of the album, it's ultimately a losing battle as the intent of the band becomes clear by the album's conclusion. And with that September Malevolence leaves us craving more.